Editor’s Note: Please see the end of this article for a special offer on Book Design Made Simple and a free sample download, courtesy of the authors. 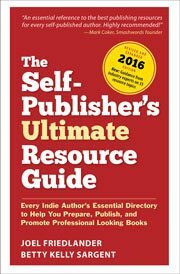 Are you a do-it-yourself self-publisher? If you answered “Yes,” then today is a good day for you! Professional book designers Fiona Raven and Glenna Collett have collaborated on a book that’s going to make you very happy. I know it made me very happy, and I’m going to tell you why. And that’s exactly what it is. Book Design Made Simple fills a huge void in the graphic arts and indie publishing bookshelf. Classic books on book design are fine for design students, but usually have little relation to what we do in today’s digital world. Previously, we had Pete Masterson’s Book Design and Production, a solid book based on an earlier version of InDesign, but one that was, to be honest, not very well designed. But what indie authors have wanted—and what they keep asking me for—is step by step instruction in creating industry standard books with today’s tools and for today’s book production requirements. That’s what Book Design Made Simple delivers, and it does so beautifully. But this book is much more than that. Book Design Made Simple is more than an explanation of how to design and produce a book, it’s virtually a course in self-publishing, too. Starting with getting the InDesign software and proceeding through the basic steps to become a publisher, the authors lead readers by the hand through the process. The tone of the book is helpful and encouraging throughout. Detailed instructions are provided on just about every task you might run into in creating a trade book with InDesign. I particularly liked the many spreads that show a sample page (and many of the sample designs are well worth emulating) on one page, and all the specs needed to create the same effect on the facing page. That’s reader friendly! In many cases the authors have come up with innovative ways to display information, like their amazingly efficient 2-page spread showing the parts of a book and how they come together. Something users will appreciate about Book Design Made Simple are the many screenshots that the authors have fully annotated, showing you in some cases exactly the button to press to complete a task. In many books, the simplest operations are overlooked, because the authors don’t realize that something so simple can confuse newcomers. Fiona and Glenna never let that happen. They are with you the entire time, and take the time and trouble to point out even small things that will help you create your books more easily. You’ll also appreciate the design of Book Design Made Simple. Most of the book is set in one of my favorite typefaces, Chaparral. The designers make great use of the sidebars, with copious notes, tips, and explanations scattered throughout. As you can see from these illustrations, screenshots are used liberally, and the authors include many samples of text pages, part openers, and chapter openers, complete with all the InDesign specifications needed to reproduce them. Even in a massive and detailed book like this, you still can’t fit everything. You won’t find much detailed information on kerning, and the discussion of book pricing is extremely short. I didn’t care for places where the authors mixed inches and picas in presenting style settings, and they didn’t include an actual CIP data block on their sample copyright page, and that’s a bit of a formatting challenge for a lot of folks. In some cases, omissions are part of including more help than you might suspect. So while the authors very helpfully provide some basic instruction in image manipulation in Adobe Photoshop, they simply can’t dive into the many tools this program provides to achieve the same goals. In other areas, InDesign gives you so many different ways to do things, it’s inevitable—and part of the creative fun—that different designers come up with various methods to get to the same place. So while Fiona uses an empty paragraph return at the beginning of her chapter opens, that seems messy to me, and I prefer to control the page “drop” with the chapter opening master page. However, this is all a way of saying that any author who wants to learn to create their own, professional quality book, will find in Book Design Made Simple all the information they need, presented in a clear, humane, and detailed manner. I can’t recommend it highly enough. Fiona and Glenna, not satisfied with putting almost 3 years into this book, have made a very generous offer. For the next few days, they have reduced the price of the book by 33%. This is a big book that’s expensive to produce. Why pay the $60 retail if you can get it for $40? PLUS, they are offering you free shipping in the U.S. and Canada. And if you’ve ever thought you might like to be a book designer yourself, this is where I think you should start. I have purchased Book Design Made Simple in digital format from eBooks.com but cannot increase the page size to read it or see the images clearly. Have attempted with several e-reader to no avail. Is there any way you can provide a pdf version of the book for me? This book looks very promising, but I just need to get over the initial hurdle to be able to actually read the content. The digital edition is a fixed-layout EPUB, and some eReaders (such as Kindle, Kobo, and ADE) are not able to display it properly. For Mac computers and devices, iBooks works just fine. For PC users, Readium via the Google Chrome browser works just fine. First launch Chrome, then go to http://readium.org/. Click the green button (Install Readium), and you’ll get a dialog box pop up. Click the green Launch App button and, when the app launches, click the plus sign at the top right (if you hover over it, it says Add to Library). Click Choose Files from the From Local File drop-down menu, then choose the EPUB file that you downloaded, and click OK. It might take a few minutes to load. Then click on the book cover, and it’ll open up the book. Great idea but I skimmed through the free sample chapters and a huge mistake jumped out at me regarding CreateSpace and most other POD companies. Both of these statements are completely inaccurate. Most PODs offer a wide variety of trim sizes. In fact, CreateSpace offers 12 sizes that they list as industry standard and have three other size options as well. To say that book pages are printed in black ink only is ridiculous since there are so many indie authors who publish full-color picture books using POD printers. Unfortunately, after seeing these two errors that should have been checked out prior to publishing, it’s made me not want to read even the rest of the sample because a reader can’t help wonder what other information is included in this book that might be misleading or just plain wrong. I’ve published with CreateSpace for years and have designed my own books as well as other authors’. With so much information available online, it’s hard for some authors to sift through it all so having a book to help DIY authors design their books is good but not when it contains blatant errors. On trim sizes, I realize that CreateSpace’s selection might seem like a “wide variety” but in fact the choices of sizes and binding styles is severely limited in POD as compared to offset printing. And that doesn’t even count the choices in paper stock, binding materials, stamping, foiling and other standard processes offered routinely by short-run book printers. And while it’s true that POD can produce color books, quality lags far behind offset printing, and the costs for these books—at least for ones that look good—can make them difficult to sell. The “commercial quality” color offered by CreateSpace and Ingram is perfectly adequate for instructional books or where the color is incidental to the book’s message. But that’s about it. You can see all trim sizes offered by the major POD vendors on this site, by the way: POD Trim Sizes. Fiona and I appreciate your pointing out our shortcomings on page 22. We will certainly change the line about black ink only that appears there. But we agree with Joel about the limitations of trim sizes and the quality of color printing with POD. At any rate, we will change the wording in the reprint. I understand that offset printing has more options than POD but even the page you referenced comparing Lightning Source and CreateSpace shows 12 B&W industry standard sizes for CS plus three other sizes and it also noted that they don’t offer anything over 8.25″, except that they do 8.5×11. However, I know they can’t do larger than that but for the average indie author, the likelihood that they would want a larger trim size from a POD is slim. And of course, POD is limited on binding, paper choice, and even book cover options (CS doesn’t offer hardcover anymore). You’re also right about the quality compared to offset printing but since this was about a how-to book for people who want to design their own books, there’s probably a good chance that if an author is going the DIY route, they probably can’t afford offset printing anyway. This is why I like POD printing because if you find errors, a new file can easily be uploaded and within a few days, everyone is getting the corrected version and the author isn’t stuck with a large quantity of books with wrontg information. Yes, Nancy, you are certainly right about the advantage of POD printing in that regard. Joel, I thank you on behalf of Fiona and Glenna for posting this mostly very positive blog. I’m a freelance book editor and one of Fiona’s closest colleagues (we’ve worked on dozens of books together), and I imagine I’m one of the few people who know how hard she and Glenna worked on their book. Your praise is extraordinary, and I’m sure well-deserved, and your constructive criticism will, I’m sure, be useful in the next edition. I couldn’t be more proud of Fiona and Glenna — especially with all the awards they’ve already won — and I thank you for generously promoting their efforts. After all, there is no book on InDesign out there that’s as comprehensive as Book Design Made Simple (that I know of). Yes, I know the kind of work that goes into this type of book because I write a lot of book design-oriented articles. It’s a massive work and one that’s sorely needed. This looks like a fantastic reference. Congrats to the authors for creating it! As the author of a similar type of reference book on a different but related subject, I can appreciate all the hard work that went into this. However, I’m a little surprised that it’s very much limited to (A) traditional print and (B) using InDesign. Just glancing at the PDF sample shows me that the authors are not clear on the details and current advantages of digital offset POD technology. And, of course, I can see “…using Adobe InDesign” right in the subtitle, but honestly, there are plenty of Indie Self-Publishers who will balk at paying for a high-end program at $20 per month via Adobe’s Creative Cloud subscription service. And I only see a tiny little mention at the very end about eBooks, which is where more of the action is all the time. Maybe a companion book about eBook creation some day? But overall, kudos to the authors for this tremendous effort. Hi Harald, thanks for your comment. The book is very much limited to print books using InDesign. In fact, that’s the entire pitch for the book. Maybe these authors will do a companion volume some day on ebooks, but I’m quite satisfied with what they have done with Book Design Made Simple. And considering that, in all likelihood, the majority of books published today are print books produced on InDesign, I don’t think that’s going to limit their market very much. Thanks for reply, Joel. I think I’m more on Nancy’s side regarding that chart on p22 (in the sample). It really needs improvement on the digital side. The authors’ description of Digital Printing’s “Method” is basically wrong. Common, modern POD printing is NOT done with laser printers using toners. That’s a tiny subset. The majority of POD print houses use HP Indigo presses. And those presses use liquid ink, although electrically charged. I also disagree with the blanket (get it: offset! 😉 statement that traditional offset is so much better in terms of quality. That was certainly true when POD was introduced 14-15 years ago, but my-oh-my, how things have changed since then. Indigo presses now include up to 7-color inksets, and the quality is vastly improved. I’ve been printing with offset for about 50 years, and I can’t believe how far digital offset has come along in such a short time. One man’s opinion, of course. Thanks for the info, Harald. And although I’ve seen absolutely stunning color books from Indigo presses, I haven’t found any printers yet who can produce these books at a cost that allows full discounting and still returns a profit to the publisher, unless you’re talking about books with very high retail prices. I join Fiona in my thanks for your review. I think we’ve learned something from your comments, especially the more critical ones. It’s just great to get some honest feedback from a fellow professional. With the added bonus of gaining a lot of attention through your blog, this is all we could have asked for. Thanks again! Your book is so good and so complete right out of the gate, there really wasn’t much to criticize, but sometimes you just have to pick those nits. Joel, thanks so much for reviewing Book Design Made Simple! You’ll be interested to know that Glenna and I struggled for ages with how to best instruct our readers to control the “drop” at the start of each chapter. As you say, dropping the top margin on a chapter opening master page is the usual way to do it. However, we encourage our readers to have fun experimenting at the design stage, which often changes the flow of text on the pages (and thereby moves the chapter openings onto the following or previous pages). It seemed simplest to create a way of dropping the chapter opening regardless of what page it landed on. There really are many ways to do almost any task in InDesign, and that’s what makes it so interesting! Thanks, Fiona. I’ve already learned a lot of tips from your book, and feel confident it will help thousands of indie authors create better books.